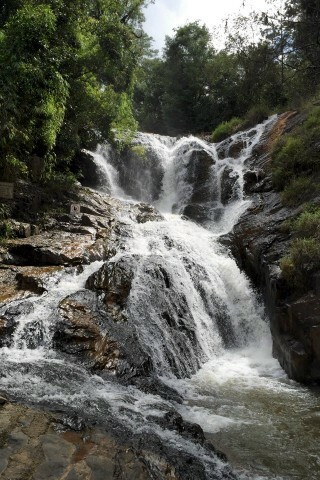 Datanla Waterfall (Thac Datanla) itself is an attractive series of cascades – but the falls themselves are the secondary attraction in this case study of “how to enhance nature”. Nature just couldn’t be left alone. Datanla is a choose your own adventure fun park. For 50,000 VND, you can zip down the hill to the bottom on a control-your-own-speed alpine coaster (think of it as a bobsled without the safety equipment). You can rent an ethnic minority costume for a photo op in front of the waterfalls or concrete animal statues. You can pay 40,000 VND for a cable car ride. Datanla Waterfall: you will either love it or hate it. Judging by the whoops and hollers of those on the coaster, many do love it. The park is located five kilometres south of the city. You can take any local bus headed south on Highway 20/the Prenn Pass. Options include the bus to Duc Trong or Bao Loc. Cost will be around 10,000 VND. Catch them from the bus stand at the top of the central market (at the south end of Nguyen Van Troi, next to Eximbank). Admission: General admission 20,000 VND, children 10,000 VND.